A health-care crisis is primarily a financial crisis in which countries cannot successfully meet people's access to medicine due to the rising cost of health-care services and, more importantly, pharmaceuticals. This crisis is worsened by age-dependency ratios and aging populations in these countries, and it then competes with the pension crisis for money and political will that are needed to solve these problems. C-SPAN recorded Ibis Sánchez-Serrano's presentation at the New York Public Library Thursday for broadcast in the near future. Elsevier Connect will post that video here when it is ready. Meanwhile, the slide presentation is available at the end of this article. Watch it here. Not surprisingly, people across the planet have expressed great dissatisfaction and concern about this situation, which is generally perceived as unsustainable in the near future. Though a health care crisis is more evident in the developing world and the United States, it is also affecting Europe, which, in opposition to the United States, has a long tradition of institutionalized social welfare. In many European countries, national health-care systems were developed to create social safety nets for all their citizens. In fact, health care costs in Europe have continued to rise in recent years, and to keep costs low, a variety of payment and reimbursement systems (i.e., copayments, reference pricing, differential pricing and others) have been created in addition to pharmaceutical price controls.Other countries that have very socially conscious health-care systems, such as Canada, Japan and Australia, are struggling to find ways to deal with rising health and medicines costs. Many US economists who admire the European and Canadian universal health-care systems have proposed the implementation of a similar system in the United States, failing to realize that even universal health care coverage (or something close to it) in itself is not a solution to the problem if facilitating access to affordable, safe and effective medicines, which is the common denominator among all nations, is not met. As we live in consumerist and pharmaco-dependent societies, people expect and demand better medicines and better, more sophisticated medical interventions. This requires a great deal of innovation, investment and the development of technologies, which eventually also increase prices and overall costs. Five years ago, Nobel laureate Paul Krugman and economist Robin Wells co-authored an article for the New York Times Book Review titled "The Health Care Crisis and What to Do About It." In it, they pointed out that "American health care tends to divide the population into insiders and outsiders. Insiders, who have good insurance, receive everything modern medicine can provide, no matter how expensive. Outsiders, who have poor insurance or none at all, receive very little." Though the second part of their statement, that the uninsured in the United States receive very little health care, is cruelly accurate, the first part, that the insured "receive everything modern medicine can provide, no matter how expensive," unfortunately no longer holds. And this is not surprising because in their analysis, the authors forgot to include a crucial, perhaps even the most important, component of health care coverage: medications.If the United States were to adopt a universal health care coverage system (or its equivalent), wholly or mostly subsidized by the government, or if the United States were to implement a health care system in the way recently signed into law by President Obama — which, needless to say, has many gaps and on which no feasibility study has been performed — it is necessary to ask this question: Who would pay for highly expensive medicines to treat diseases such as cancer, where treatment could cost more than $100,000 a year for medicines alone? This does not even include the even more expensive drugs that are used to treat severe chronic ailments and rare disorders, nor does it take into account doctors' high salaries and hospitals' huge fees. After all, the purpose of not having drug price controls in the United States and of having a privatized health insurance system is to create incentives for the pharmaceutical and investment industries to take the high risks that are involved in producing innovative, better and safer drugs and to allow very ill patients to access those medicines through their private health insurance. On the other hand, one wonders how effective and sustainable the cooperative system proposed by President Obama in his health-care reform plan (which was actually a proposal championed by Democratic senator Max Baucus chairman of the Finance Committee) will be — if it can even survive without going bankrupt — if we consider the fact that many patients will be medicated with highly expensive drugs. In fact, there is growing evidence that the costs of US health care reform will be higher than expected.It is often claimed that prescription drugs account for only 13 percent of total health care costs. However, given the economic slowdown, the financial disasters that struck the world in 2008, and the fact that many people have to pay a large portion of medical costs out of pocket, 13 percent is still a large percentage. In the United States, the percentage of people aged 50 or older has increased significantly because the baby boom generation is beginning to reach that age, and statistical analyses project that from 2000 to 2030, the number of Americans over age 65 will double to around 71.5 million.Unfortunately, the very unhealthy lifestyle of the United States is increasing the incidence of many chronic disorders, such as diabetes, atherosclerosis and hypertension, which will continue to increase health costs to the point of bleeding state and federal budgets and creating great disincentives for private companies to provide health insurance coverage. The drugs used to treat such chronic conditions are very costly, and millions of people are struggling with these costs, not only in the United States, supposed to be the most powerful nation on the planet, but globally as well. The key issue that is missing from the equation in the current health-care debates is the following: How will people have access to the best medicines in the world, and who is going to pay for them? Economists and politicians in the United States say that that is not a problem because nearly 80 percent of prescriptions written in the United States are for generic drugs, which are easily affordable. But in examining this situation carefully, we realize that this is indeed a problem because generics companies are not innovators. In other words, they make money from drugs that have already been discovered and developed by other companies and that have gone off patent, and effective though these drugs may be, there is always room for improvement in terms of dosing, effectiveness or safety. Not only that, but consider the large number of unmet medical needs, such as those requiring antibiotics, that exist today and that will continue to increase, as well as the increasing incidence, diversity, and complexity of chronic ailments among the world population. Furthermore, it has recently been acknowledged by regulators that some generics really are not equivalent to the branded drugs that they are imitating, which has prompted the US Food and Drug Administration (FDA) to consider (and adopt) tougher new standards to make sure "there is less variability" among generics, which has certainly concerned the generics industry. Not to mention the ever increasing problem of fake and counterfeit drugs in the developing world and even in the United States! What's required for a solution? Health-care reform, therefore, should be not only about health insurance reform but also aboutpreventionreform, biopharmaceutical industry reform, intellectual property law reform, regulatory system reform, university-industry collaboration reform, basic science and innovation reform, pharmaceutical marketing and pricing reform, tort reform, medical education reform, and other types of reform — all of which contribute directly and indirectly to the cost of the health care system. Ibis Sánchez-Serrano is founder and President of the Core Model Corp. and a world-leading expert on global health care and pharmaceuticals development. He is the author of The World's Health Care Crisis: From the Laboratory Bench to the Patient's Bedside (Elsevier, 2011), which examines global health care and the roles of the insurance and biopharmaceutical industries, innovation, R&D productivity, investment and regulation within it. In 2006, Sánchez-Serrano published a seminal article on translational research and academia-industry relationships in Nature Reviews Drug Discovery: "Success in translational research: lessons from the development of bortezomib," where he introduces a novel model, his Core Model, to speed up the process of drug development. He has also co-authored papers in molecular genetics in international peer-reviewed journals and has given presentations for organizations around the world, including the first official conference of the International Chemical Biology Society at the Novartis Institutes for Biomedical Research, the International Conference on Drug Discovery and Therapy in Dubai and the fourth World Justice Forum in The Hague. 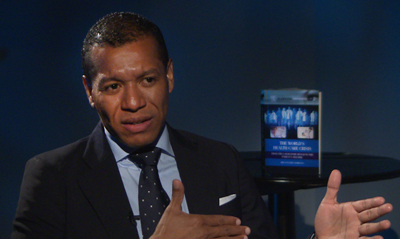 Sánchez-Serrano is quite involved in community development in his native Panama and has spent significant time working on education and health care in rural communities. He has been interviewed by CNN, EFE and the Associated Press (AP) and recently by the US-based TV network UNIVISION, among other international media, and he was nominated for the prestigious Prince of Asturias Award 2012 in the scientific and technological category for the international importance and scope of his work. In 2013, Ibis received a recognition award from the Fulbright Alumni Association in Panama for his contributions in "Biomedical Research and Science and Technology Development" and for the "Evaluation of the Panamanian Health Care System." Sánchez-Serrano holds a BS in genetics and art history from Iowa State University, a Master in International Business Relations and Technology Management from the Tufts Fletcher School of Law and Diplomacy in collaboration with Harvard University and MIT's Sloan School of Management, and he did graduate studies and research in molecular genetics and biotechnology at the University of Pavia in Italy, the Pasteur Institute in France) Iowa State University and Boston University. He speaks four languages and is an art, classical music, and literature connoisseur. [divider] Ibis Sánchez-Serrano based this article on a presentation he gave at the New York Public Library on last week. Thank you, Bee. I'll be posting the C-Span presentation later today. 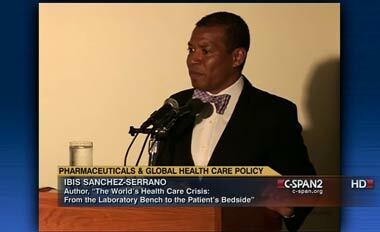 I listen to Mr. Sanchez Serrano on C-Span radio this morning. Talking about his book on world health care. I find it to be very Educational and intresting. Being some one who was born on a small island in the Caribbean I could relate to his very being. Everything he said makes sense for me. Coming to the United states at a young age of 18yrs and growing up in this country I am very thankful for the way I was raised by a single Mom who did not have the education but have the common sense in knowing what she wants for her childrens. Most importantly is respect for themself first, and their elders who they come in contact with. up bringing help me in so many ways when I set foot here in these United States.